There are many good frameworks out there, but the one I prefer for quick demos, simple applications and rapid scaffolding is Grails. Why? Simply put – with just a few lines of code you have a fully functional application: user interface, controllers, data validation and persistence. But Grails is much more than a tool for quick prototypes. It is a fully featured platform based on the rock solid foundation of Spring, Hibernate and other enterprise-grade frameworks. Plug-ins can be added any time and they will seamlessly add new features to the application. Grails uses Groovy as its primary programming language, but as it runs on the Java Virtual Machine, you have full access and interoperatbility with any existing Java library. Tooling support is also excellent, both from command line and from IDEs like Eclipse or IntelliJ IDEA. If you think that the above paragraphs are just hyperboles from an enthusiast fanboy, continue reading and experiment for yourself how easy is to build a new app from scratch. To start working with Grails, you need to go to its web site at https://grails.org/ and download the platform and documentation. For this post I have been using Grails 2.4.3 (which includes Groovy 2.3.6). Once downloaded, decompress it in any folder of your choice (we will refer to it as GRAILS_HOME going forward) and I also recommend putting GRAILS_HOME/bin folder to your system or user PATH. Of course, you will also need a Java Development Kit installed and preferably the JAVA_HOME/bin will be on the PATH. I have been using the JDK 7 update 75 as it seems to be some issues with JDK 8 (for example, SEVERE: Problems copying method. Incompatible JVM? errors at runtime). Optionally you may use an IDE to help you with coding, testing and debugging activities. Eclipse (through the Groovy/Grails Tool Suite from Pivotal), NetBeans and IntelliJ IDEA Ultimate Edition support Grails very well. Although a Grails project can be created manually that would not be very productive, so the best way to start working is to create a new project from a template using Grails tooling. The application I want to build is a simple School management app: Teachers, Alumns and Classrooms. A Teacher has 3 attributes: name, date of employment and salary. 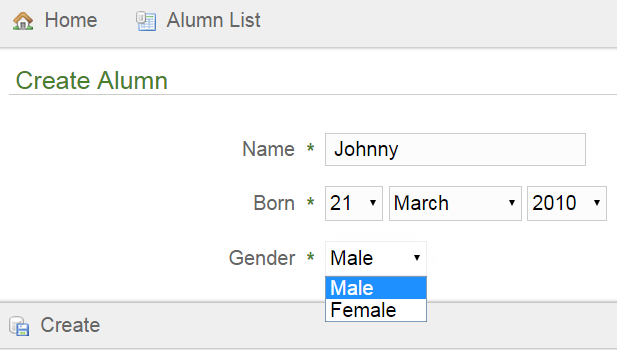 An Alumn has 3 attributes: name, date of birth and gender. 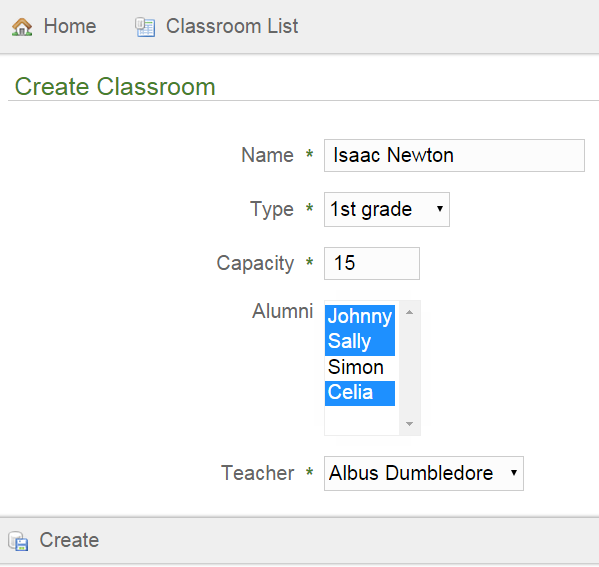 A Classroom, finally, has 5 attributes: name of the class, type (i.e. 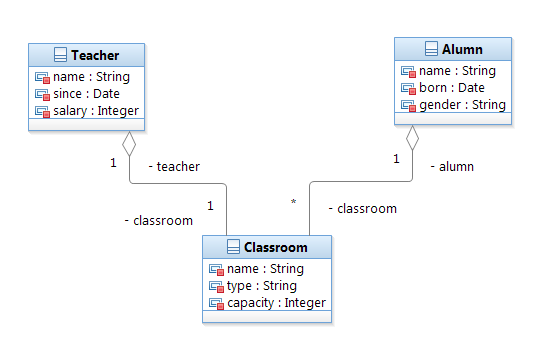 grade), capacity and two associations with Teacher (1:1) and with Alumn (1:n). Simply put, a Classroom has one Teacher and many Alumns attending it. This is an UML model of our application domain. In Grails, the domain is preferredly defined as Groovy Classes. In Groovy/Grails, you don’t need getters and setters, and it’s very easy to define constraints to properties, like a maximum length or a range of valid values. Domain classes in Groovy looks very compact and neat – just the key information and the platform takes care of all the rest. The model is simple, concise and understandable even if you don’t know Groovy, which is an excellent test in my opinion on how good the language and platform are defined. Once the domain is built, we are ready to scaffold the whole application. One important aspect to note of Grails is that there is no code generation as such unless you want to do it. As a result, data access, controller actions and user interfaces views are generated at runtime directly from the domain definition. If needed, the whole applicaiton code can be generated which allows to start working on the specifics, but if a CRUD app is just what is needed, then you will get it “for free”. With Grails is easy to start with a new application from scratch. 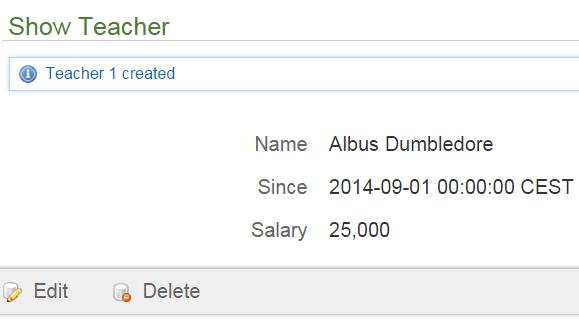 Its scaffolding capabilities are impressive, generated UI and code is nice and exemplar. You can use it for simple applications with minimal effort or to setup a solid foundation from where to build more advanced enterprise grade applications. Great summary! As you mentioned in the opening, the plugin architecture makes adding support for many opensource tools and libraries remarkably quick and easy, usually with completely reasonable default configurations. This is one of my favorite features of the framework and sometimes gets overlooked. Can’t wait for 3.0 to go GA.
You nailed it. And 3.0 is going to be epic!